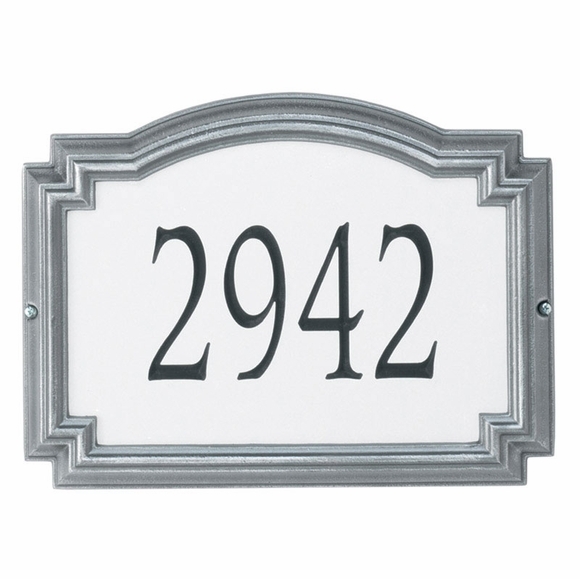 Williamsburg Reflective Address Plaque - - features silver reflective poly vinyl film, a pewter aluminum frame, and engraved black numbers. Sign holds one line of text. Lawn version includes two 18" stakes. Estate size is 20.5" x 12" x 1.25" and holds up to five (5) 5" numbers. Standard size is 14" x 10.25" x 1.25" and holds up to five (5) 3" numbers or four (4) 4" numbers. Please type desired text in the Line 1 input box and select style desired from drop-down box.